As I noted in my liveblog of Steve Ballmer’s CES keynote, I barely made it in, as the speech was packed. You’d think Microsoft would have wanted to make sure that their No. 1 Windows Phone partner was front and center — if not on stage — for the speech. That’s doubly true, considering Nokia’s phone was one of the few bits of news Microsoft was making that day. First off, he said that the Lumia 900, introduced at the show, reflects Nokia’s commitment to designing products specifically for North America. He wouldn’t rule out the large-screen Windows Phone shipping elsewhere, but said its LTE radio and big screen were things that the company knew were needed in the U.S.
“The operators, particularly AT&T and Verizon, are competing on the basis of their new 4G networks,” Elop said. But, no, I couldn’t get him to say when it would ship, or what it will cost. But, he said, the important thing is that the devices are in good shape. One of the key next steps, obviously, will be transitioning from a period in which the company wanted to keep the Lumia 900 device a closely guarded secret to one in which it wants other people to discover it. Elop said the device packs Nokia’s best screen, best camera and best design. The next step, Elop said, is getting the devices in the hands of the sales staff — at the AT&T stores and other retailers — who will decide whether to pitch that or another high-end smartphone. So would Nokia consider opening stores in the U.S.? 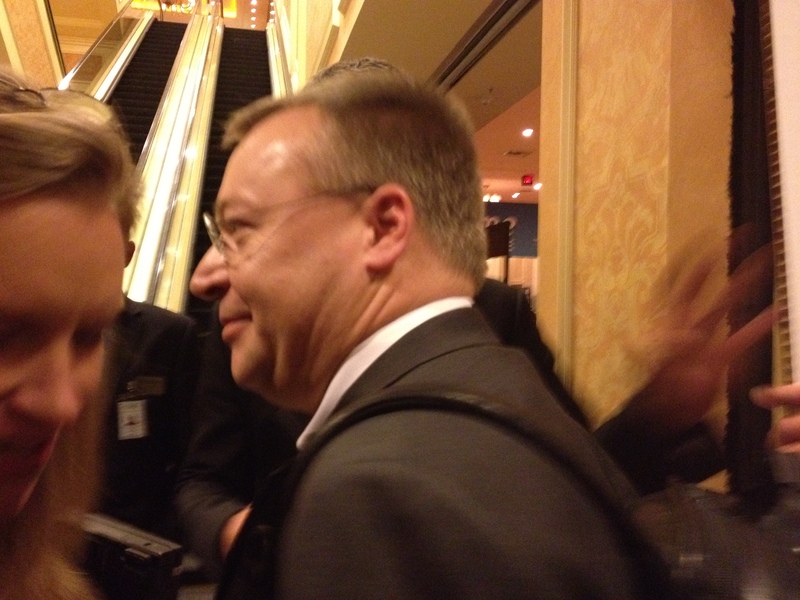 Elop didn’t rule it out, but he noted that given the role of carriers here, it is probably less critical than in places where devices are sold unsubsidized for use with any carrier.